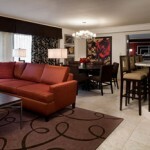 In the heart of the Las Vegas Strip rests the much-celebrated Harrah’s Vegas hotel. The lively atmosphere at Harrah’s brings Mardi Gras to the Las Vegas scene year round. At the epicenter of the party is Harrah’s Carnaval Court. It is an open-air street party that goes on and on, day and night, with live bands and DJs entertaining a dancing crowd around the clock. Start the Mardi Gras celebration Vegas style with a visit to the casino floor. 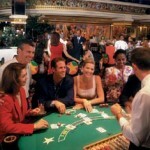 Experience Harrah’s wildly popular poker room and friendly table game dealers. For a priceless entertainment experience, see the Tony Award winning musical The Million Dollar Quartet. Set in 1954, this show brings Johnny Cash, Jerry Lee Lewis, Carl Perkins and Elvis Presley together to relive one of rock n’ roll’s greatest jam sessions. Another celebrated hit at Harrah’s is the Broadway show, Defending the Caveman. This is a hilarious play highlighting the differences between men and women with a blend of psychology, sociology, and prehistory all rolled into one contemporary illustration that leaves audiences laughing and nudging their spouses in recognition. Ever want to participate in an eating challenge for a spot on a wall of fame? Visit Toby Keith’s I Love this Bar restaurant at Harrah’s, and enjoy live country performances and an entertaining staff while filling up. For a spot on this wall of fame (and a t-shirt to go with it), eat a Big Dog Daddy meal, which includes: 100 oz. of burger, bun, cheese, toppings, a pound of fries, a quart of beer and an order of Twinkies. To wash the Big Dog Daddy experience down, take a walk to Harrah’s frozen drink bar, Numb, and enjoy a frozen drink – order it in the souvenir cup and make some new memories with this keepsake. As an alternative, head to The Piano Bar and sing the night away in a karaoke contest. Enjoy authentic piano duels that are sure to spark a celebration! Harrah’s hotel stays are comfortable and spacious, with options for pet accommodations. The Pool at Harrah’s is heated and Olympic-sized, exclusive only to guests. The Spa and Health Club is also available to Harrah’s guests for a good pampering and a healthy workout. Visit Harrah’s Hotel & Casino in the heart of the Las Vegas Strip for a Mardi Gras celebration Vegas style!